Seven years after TransCanada Corp. initially applied for Keystone XL pipeline permit, US President Barack Obama rejects the bid. The Keystone XL (KXL) pipeline wouldn’t have been a silver bullet to launch the economy, nor would it have haven an express lane for oil and gas industry, U.S. President Barack Obama told the nation Friday in a statement from the White House. Rather, it could speed along the climate change that lawmakers around the world are fighting. With the United States leading the way, the nation must hold itself to the same climate standards it demands of others and reject the pipeline, he said. 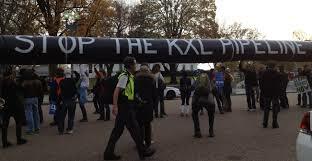 The KXL would’ve transported 830,000 barrels per day of heavy oil sands – about 700,000 barrels from Canada – while picking up an additional 100,000 or so barrels from heavy U.S. plays. Advocates said it would also reduce U.S. reliance on nations less friendly to the United States, including those in the Middle East and Venezuela. A southern leg of the pipeline is in place and moves heavy crude from the Cushing hub to Gulf Coast refiners. Environmentalists have long opposed the pipeline. Several iterations of the route have been provided by TransCanada. The most recent proposal actually had support from Nebraska lawmakers, where an ecologically sensitive area had been an issue. Flanked by Vice President Joe Biden and Secretary of State John Kerry, Obama said his administration had heed the advice from the State Department that the 36-inch, 1,200-mile pipeline stretching from Alberta, Canada, to Cushing, Okla., is not in the best interest of the United States. Obama said it would not provide the jobs expected by Republicans, but may in fact cause pollution and lead to more climate problems feared by Democrats. Russ Girling, president and CEO of TransCanada, the Canadian company that’s been waiting in the wings for years while the president has mulled the issue, said the company is disappointed. The president said he had spoken to a disappointed Prime Minister in Alberta when he talked with newly elected Justin Trudeau, but he expected the friendship and cooperation between the two countries would continue. Almost immediately, those who have been monitoring the progress of the pipeline began piling in on either side. “It’s ironic that the administration would strike a deal to allow Iranian crude onto the global market while refusing to give our closest ally, Canada, access to U.S. refineries,” said API president and CEO Jack Gerard. “This decision will cost thousands of jobs and is an assault to American workers. It’s politics at its worst. Opponents of the pipeline have said the thousands of jobs touted by KSL supporters would dissipate once the pipeline was complete, leaving only newly created 50 jobs. U.S. Sen. Lisa Murkowski, the Republican chair of the U.S. Committee on Natural Resources, raised the jobs issue, saying in a statement that it would create thousands of high-paying jobs and ensure long-term energy security. More than that, however, Murkowski said the decision made was “not symbolic, but deeply cynical” and distorted the facts. Kenneth Medlock III, senior director of the Center for Energy Studies at Rice University, told Rigzone he wasn’t surprised by the outcome. While the president certainly had his detractors, environmentalists touted the decision as a major victory. Next articleBabatunde fashola, the round peg in round hole: engineers and technical professionals need to make sacrifice!